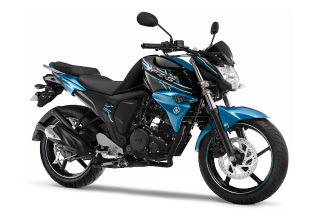 Yamaha Motor Releases New FZ and FZ-S for Indian-made FZ-series, A key 150cc sports model lineup and that will lead sales expansion in India and abroad - News Releases | Yamaha Motor Co., Ltd.
IWATA, June 30, 2014 - Yamaha Motor Co., Ltd. (Tokyo:7272) announced today that the new FZ and FZ-S, a refresh of the FZ sports series powered by an air-cooled 150cc engine, will be released in the Indian market in July 2014. The new FZ and FZ-S are successors to the existing FZ16 and FZ-S, and were developed with the concept - a fusion of improved fuel economy, performance, and sharp styling. As compared to the standard model FZ, the FZ-S is also equipped with a meter visor for a sportier look. Main features include 1) a newly developed 150cc fuel-injected engine that achieves 14% improvement in fuel economy over the existing model while offering excellent acceleration performance, 2) newly-developed lightweight frame and tires that provide lighter handling, 3) body design that combines a sense of power, boldness, and sharp lines, and 4) a movable rear fender with an integrated sari guard for more agile styling. India has the world's largest motorcycle market with a total annual demand of more than 14 million units (Yamaha Motor survey, 2013), out of which, 150-180cc sports-type motorcycles comprise approximately 10%. The FZ16 series, which Yamaha Motor introduced to this market in 2008, won acclaim from trend-conscious male riders in their teens and twenties. Thanks to this, the total unit sales of the FZ16 series in the Indian market reached 770,000 (up to the end of May, 2014), and has contributed to creating Yamaha Motor's sporty image. In addition, a high volume of this series is exported outside of India to Central and South America etc., and is part of the core of our motorcycle business in India. Customers in these countries and regions prefer sporty performance and demand good fuel economy. 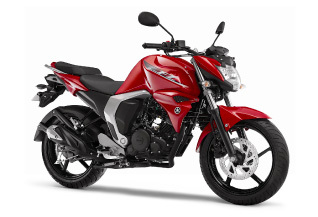 The new FZ-series which answers to these demands will further expand sales both within India and abroad. Manufacturing and sales of the new model will be carried out by Yamaha Motor's group company, IYM (India Yamaha Motor Pvt. Ltd.).